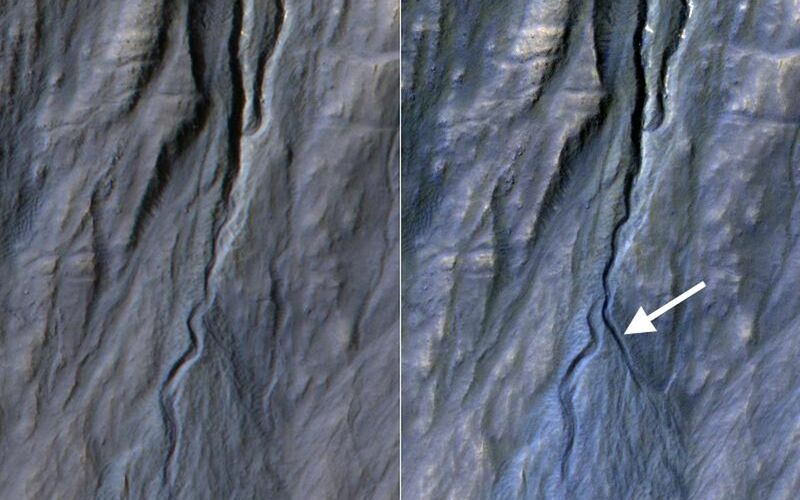 This pair of before (left) and after (right) images from the High Resolution Imaging Science Experiment (HiRISE) camera on NASA's Mars Reconnaissance Orbiter documents the formation of a substantial new channel on a Martian slope between Nov. 5, 2010, and May 25, 2013. The location is on the inner wall of a crater at 37.45 degrees south latitude, 222.95 degrees east longitude, in the Terra Sirenum region. Gully or ravine landforms are commonly found in the mid-latitudes on Mars, particularly in the southern highlands. These features typically have an alcove at the upper end, feeding into a channel and an apron of debris that has been carried from above. Researchers using HiRISE have discovered many examples of gully activity likely driven by seasonal carbon-dioxide frost (dry ice). The changes visible by comparing the 2010 and 2013 observations at this site formed when material flowing down from the alcove broke out of an older route, eroded a new channel and formed a deposit on the apron. Although this pair of observations does not pin down the season of the event, locations HiRISE has imaged more often demonstrate that this sort of event generally occurs in winter, when liquid water is very unlikely. Despite their resemblance to water-formed ravines on Earth, carbon dioxide may play a key role in the formation of many Martian gullies. 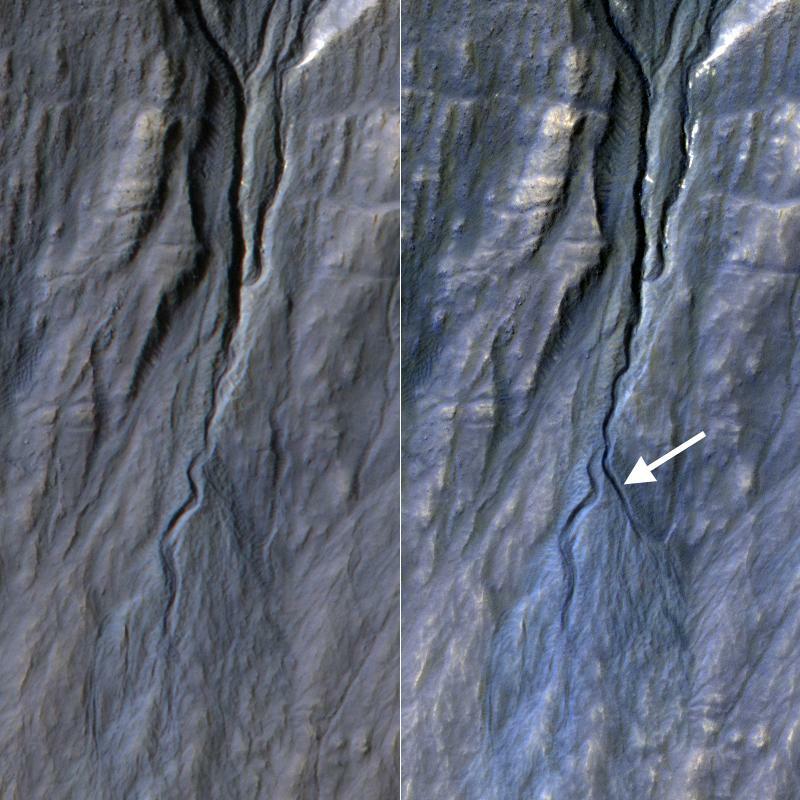 The image on the right is one product from a HiRISE observation catalogued as ESP_032011_1425. Other products from the same observation are available at http://uahirise.org/ESP_032011_1425. The image on the left is from observation ESP_020051_1420 (http://uahirise.org/ESP_020051_1420). A May 14, 2009, observation of the same slope is at http://uahirise.org/ESP_013115_1420. HiRISE is one of six instruments on NASA's Mars Reconnaissance Orbiter. The University of Arizona, Tucson, operates HiRISE, which was built by Ball Aerospace & Technologies Corp., Boulder, Colo. NASA's Jet Propulsion Laboratory, a division of the California Institute of Technology in Pasadena, manages the Mars Reconnaissance Orbiter and Mars Science Laboratory projects for NASA's Science Mission Directorate, Washington.